The story involves Stanny Dee and Ollie Dum (who may or may not represent their usual comedic personas) trying to rescue Little Bo-Peep and her friends from the cruel Silas Barnaby; an angry old man who looks like a 40K Witch Hunter. Plus, his EUPHORIC attitude and looks only adds to the creepy factor. This greedy old miser wants Bo-Peep for himself after the mortgage for her house (which Stan and Ollie live in as well) flops. But Little Bo’s in love with Tom Tom, the piper’s son and not our favorite nasty “gentleman.” And even though our heroes work their hardest at the toy factory, it just isn’t enough to cover Mother Peep’s financial woes. But, since our favorite fools like their share of jokes, they only succeed in angering Barnaby more, even losing their jobs. With the household in peril, our heroes decide taking the care of the mortage in less lawful ways is in order. Of course, it goes horribly wrong and they’re both put in trial for crimes. Ol’ Jerkface agrees to let ‘em go with agreement with marriage, so Bo Peep gives in… only for Ollie and Stanny to foil the plans in much hilarity. After Barnaby finds out about Bo’s love triangle, he tries to figure out anyway to off Pretty Boy, “Tom Tom” (the Piper’s son.) by framing him with the slaying of one of the three pigs. And so, off to bogeyland with Tom! And so, our heroes venture to the vile abyss and fight off the Krampus rejects to request the love interest! Unfortunately, Barnaby has a secret Batcave entrance to Bogeyland and tries to wreck things for our heroes. Silas goes bonkers, summoning his bogeyman horde and the monsters wreak havoc on Toyland! Remember those botched soldiers from before? They come to the rescue and ensure a happy ending for our characters! Right off the bat, we get treated to visuals that blend classic storybook fairy tales with the cartoons of Walt Disney and related artists. And if you didn’t believe me on Disney, Mickey Mouse appears himself in his most terrifying incarnation yet! No matter, the realm of Toyland has familiar sights like a giant shoe house, a cradle upon a tree top, and Santa’s toy factory. The denizens are cheery and colorful classic characters, save for the nasty old grump himself, Barnaby. Even with this stick in the mud, the whimsical atmosphere of toyland is a sight to behold. Buildings made of candy, books, and other oddities; living toys like wooden soldiers, dolls, and stuffed toys; and the general day by day cheer that goes on throughout the mostly peaceful little town. All of these carry a charm truly brought to life in the colorized version aired only once a year! Now, this film wasn’t originally called “March of the Wooden Soldiers”, as this is the recut version. 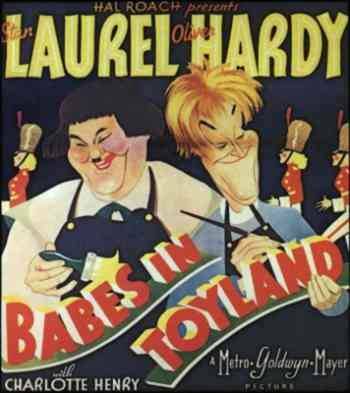 “Babes in Toyland”, as the film was originally called, was mostly unedited in its transfer to the colorized version most known today. The only differences were the fight between Tom and Barnaby being significantly shortened, as well as the introduction leading into the story. In terms of story, it’s a tale of love, a corrupt king (of sorts), the antics of our two comic relief buddies; and surreal song and dance numbers! What’s not to love? Also, Santa’s kind of a douche. Not to mention the film has countless wonderful gags that are still wonderfully hilarious. The failed burglary, the dunking scenes, and the marriage scenes are just a few to name off. Edit: You can watch it here, if you’re interested!